This English Knights Jousting Close Helm is based on the style of helmet that became popular during the end of the medieval era, thanks to the comprehensive protection that it provided. Compared to the sallets and barbutes of the eras prior, this helmet was a marked change, ensuring that the head and neck were fully covered. The helmet consists of a tubular head protector, connected to hinged gorget, which rests around the collar. The top of the helmet also features a small central ridge, which helps to shunt blows off to the side. All close helmets possess a visor of sorts, and on this jousting model, the visor features a narrow, long eyelet, as well as small cut-out holes to help with helmet ventilation when the visor is lowered. 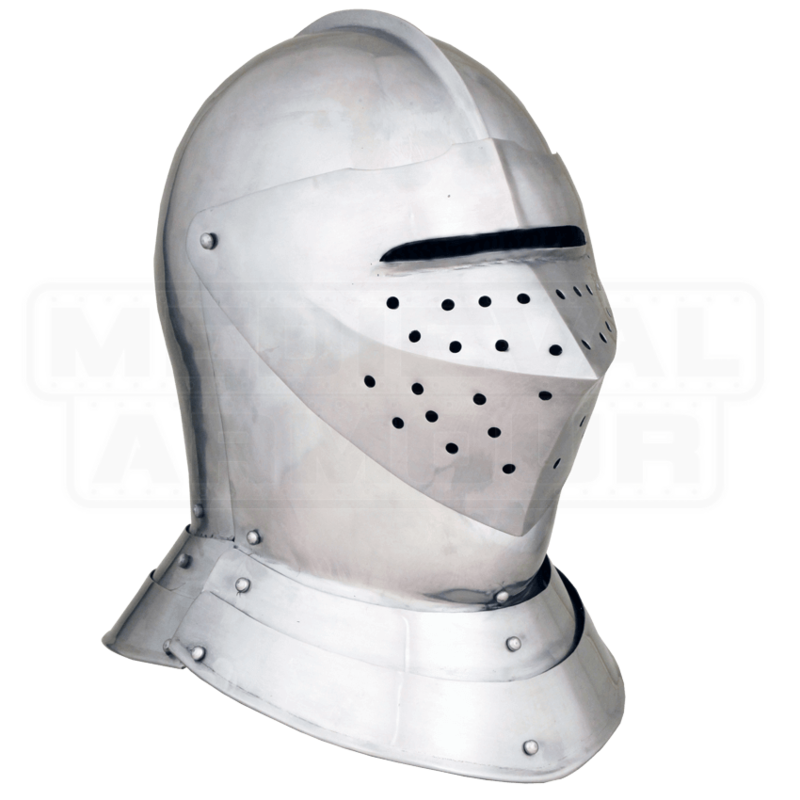 The helmet is offered in one size, and it can be ordered in either 18 gauge or 16 gauge steel (18 gauge is suitable for costuming and LARP combat, while 16 gauge is more suitable for light reenactment, LARPing, and some SCA). The helmet also features an internal liner. Pair this English Knights Jousting Close Helmet with some additional armour, and you will look every inch the knight in shining armour, ready to take to the field and win the event, and perhaps, a fair ladies token, as well.